We're busy being a band. There's the usual band stuff of practicing several times a month. Then there's the recording bit. Justin's regretting not getting at least an Associate's degree in electrical engineering as he works on aligning the tape machine. He's spending a lot of time tinkering with this thing. Thad's not worried; he knows how Justin gets. 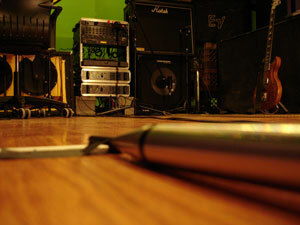 Now let's say you want to get the best recorded sound of your music. Let's pretend that you already know the best microphone to use for your given application. But how do you know where in the room to put it? Even assuming you have a general idea, you've got to narrow it down. 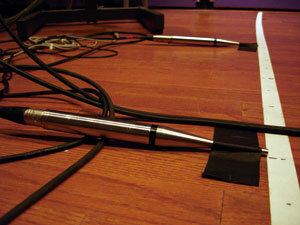 Moving some microphones a fraction of an inch can make a big difference in what gets printed on the tape. And you've got three dimensions: up/down, back/forth, side/side. And any limitless combination thereof. Still with us? Great. 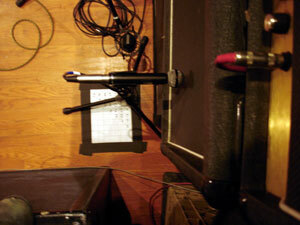 Now, you can move those microphones along the three dimensions we mention above. Let's keep it simple - side to side. That is, mentally split the room in half and make comparison recordings with the microphones A) one foot each out from the center (and thus two feet apart), B) three feet out (six apart) and C) five feet out (ten apart). The trick is to make sure this is the only thing you're changing - the program of music needs to be the same, the height from the floor (in this case, less than an inch) needs to be the same, the distance from the center of the room needs to be the same, the distance from the back of the room (six feet here) needs to be the same ... it cycles through. After the first part, the mics are 2 feet apart, then 6 feet part, then 10, then 2, 6, and so on. Just change one thing at a time. And what do you find? There's still a pretty crazy difference. Below we've attached a sound file that makes this comparison. The first 10 seconds is just the direct drum/guitar/bass sound. There's a moment's break, and then the next 10 seconds is the same sound mixed equal in level with two microphones placed at the A) specification mentioned in the paragraph above. Then B), and then C). Then it goes back to A), then B) ... you get the idea. It's an example of how a stereo pair of microphones sounds different at two, six and ten feet apart, all other things being held as equal as possible. We think we've settled on which we like best, but tell us what you think via [ e-mail ]. We've already decided that this is the best sounding height, but there's still dimension three - back and forth between the amps and the back wall. 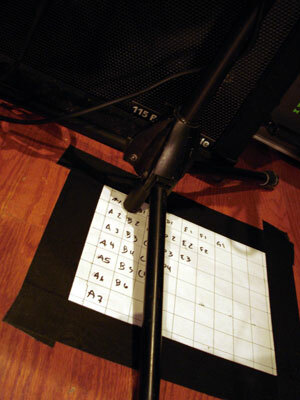 Once we've got this nailed down, we'll be keeping the microphones there for the recording of the whole record. *acceptably means good enough to go on with the rest of the experiment. It's still a 196 resolution MP3, so don't listen for the difference in the high end. Most of the interesting difference takes place in the mid to low region. Oh, and the tape was kinda chewed up.